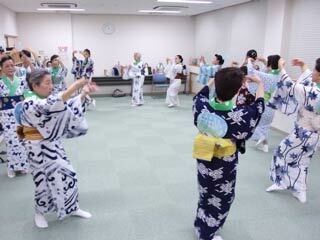 Dai Tokyo Ondo (大東京音頭) is very popular Bon Odori song in Tokyo. The move is slow, but there are many moves. It's is very joyful dance. Face your stomach to the center of circle, and count 8. Clap & clap & clap, clap & clap. Turn right at the last clap. Step right foot and bring your hands front of your face just like Mt. Fuji. Step left foot and draw Mt. Fuji. Step right foot cover your face with right hand. Keep your left foot in the air. The same with the other side. Step right foot from the air, and make a large circle with entire arms. Then, make small circle with only wrist. Step back right foot and step right foot again. Step left foot. Stretch your left arm, and cover your face with right hand. Step right foot, and other side. Put you hands side, and bend your knees. Make two size of circle again but this time with your left foot step. Step left foot. Stretch your right arm, and cover your face with left hand. Step left foot, and other side. Turn clockwise with 4 steps, and just like sweeping your face with both hand. Face to the center of the circle and step in with right foot. Open your arms front. Then, back to the beginning.